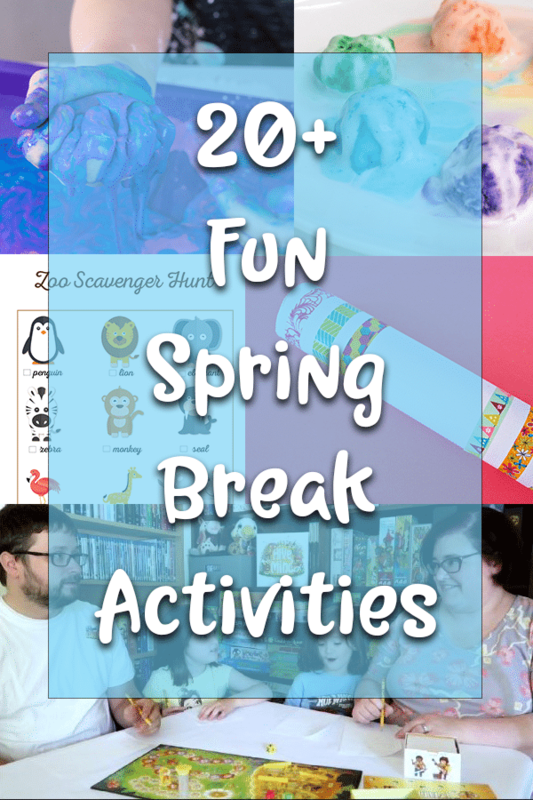 Keep your kids from bouncing off the walls and maintain your sanity by getting ready with these spring break activities! I can hardly believe it's almost time for spring break. It feels like winter just barely ended here in Wisconsin. I'm so glad the snow is finally melted and there is sunshine nearly every day, but I know spring break means summer break is right around the corner. Do you usually go on vacation for spring break? We aren't traveling anywhere this year, but may fit in a few day trips. Whether you are enjoying a vacation, staycation, or just hanging out at home, use these ideas to keep spring break activities fun for you and your kids. I love my kids, but they can drive me crazy during school breaks. They get used to the routine throughout the school day and I get used to my daily routine while they are gone. And, of course, being siblings they have the ability to drive each other crazy with so much togetherness. These are some ideas I use to make the break enjoyable for all of us and help my kids stay busy while I get stuff done too. Play board games! Here are several FUN games that you can play in 20 mins or less with your kids. (No Candy Land or Monopoly on this list). Here are a few board game options if your kids are feeling stir crazy. Plan a themed family game night. Our curated family game boxes on our family gaming site are perfect for this! Do science experiments like melting rainbows or candy science. Do crafts like making soda bottle blossoms or a kaleidoscope. Do printable activities (word searches, mazes, coloring, etc). I recently created the Extraordinary Adventure Printable Activity Book growing bundle on my other site (which means I'll continue to add pages to it over time and send them to you). I hope these ideas help you maintain your sanity or inspire you to think of other ideas on how to keep your kids busy during spring break.